After writing yesterday's post, I realized I was almost certainly thinking about the problem the wrong way. In particular, I implicitly set the problem up as question about whether the trend in yields might turn negative in the near future. But I realized that it would take an extremely severe scenario for that to occur - much worse than current science will support. They were certainly down, but they were 20-25% below normal, not 50-80% below normal. 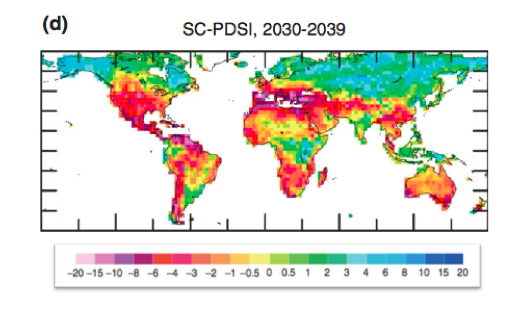 Secondly, there will not be a drought every year from here on - even if we assume Dai's projections are right. Instead, in that scenario, there will be many relatively normal years in the next few decades, but the droughts will become gradually more severe and more frequent. 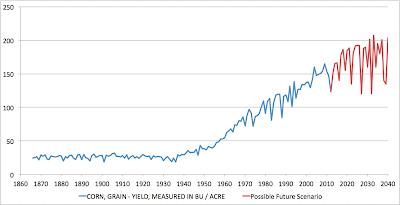 In the normal years, yields will continue to increase as agricultural technology is likely to continue to improve (and in particular the biologists are likely to be very focussed on improving drought tolerance). We might expect the pace of increase to slow (as drought increasingly becomes normal) but it's very unlikely that yields in the more normal years will drop. This is a hand created scenario for corn yields that involves increasing variance and a slowing trend, but not an actual trend reversal. I think this is more what we might expect to see if Dai turns out to be right. Of course, this is still not going to be fun - it would mean a lot more years like this one with big droughts and much higher food prices (particularly as population continues to grow against a slowing and choppier yield trend). And by 2100, things could be seriously ugly. That last bit about population is where two forces collide. The need for a consistantly growing food supply (at the green revolution rate of WWII to 2010)is matched with population that is growing to 9 Billion in 2050. But the colliding forces condition matches a saturating level with a continued population growth as mentioned before. A disaster in the making. 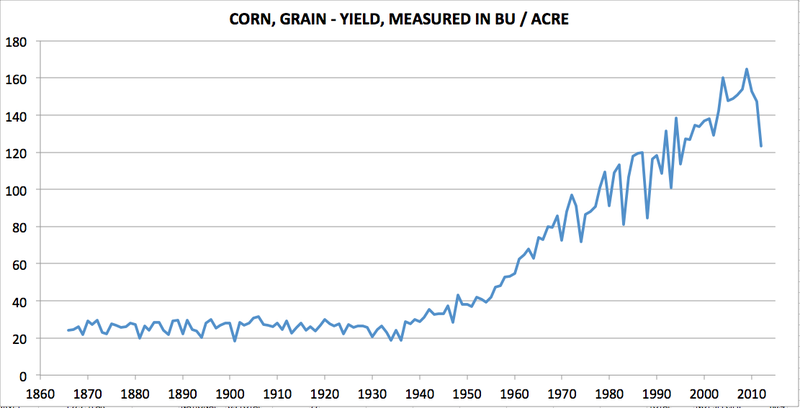 GMO may help us keep us where we are, but how will ever increasing prices for diesel, natural gas and fresh water for irrigation impact the graph you created? I suspect it will dimish some of the production to one step level down. I think prices for diesel and natural gas will not have a large impact in a world of high food prices since farmers will be well placed to outbid other users for those resources (and agriculture is not a large fraction of total demand for those resources). Obviously irrigation water is another story - agriculture does use a large fraction of water. On the one hand, there probably are some places where increased irrigation will be a useful response to drought. On the other hand, there are places (India, parts of China, Ogallala in the US) where groundwater is being drawn down unsustainably and will increasingly be a resource constraint that worsens other problems in those regions. I tend to think a s curve is more likely that indefinite growth. We may continue upwards for a while but at some point the gains start getting harder and further apart unless there is some breakthrough in our understanding. Problem is unlike minor gains around a major breakthrough, major breakthroughs are unpredictable; could be three days from now or three millennium. This post has made me reconsider my position on ethanol production from maize/corn. In an era of greater harvest volatility, it might be a good thing from a food security point of view ... provided we remain committed to open global trade in food. The bulk (about 85%) of maize is used for livestock fodder and ethanol production rather than directly as food. In times of shortage, we can reduce ethanol production. When things are really bad, we can kill and eat corn-fed livestock, and then eat the maize they would have eaten. Of course some of the latter is happening now in North America, but I am thinking more globally. Say that one year the rice crop were to be reduced 25% in both the main rice-growing regions, South Asia (India and Bangladesh) and South-East Asia (Indonesia, Viet Nam, and southern China), cutting the global harvest by 13%. The countries affected could buy corn to substitute for rice. Provided, that is, that chronic harvest volatility does not cause countries to halt exports more than temporarily. Rice is most exposed to this risk, but both wheat and corn have considerable exposure as well. Simultaneous failure (like this year's US corn crop reduction) in both Europe and northern China would be several times worse than the 2010 losses in the Russian harvest. If this year's drought were echoed in Eastern China, corn losses would increase by 50%. Finally, compensating increases in planting may mean that quite often there is overproduction, and therefore a depressed price. Farmers may find themselves making losses one year, and having their crop commandeered by their government the next. I see where you are going with the ethanol argument but I'm not sure I'm going to follow you: 1) right now the mandates that draw ethanol into the fuel system are not easily flexible, so there's no easy way to adjust them depending on the harvest (requires action from the gridlocked political system). And then if you imagine a more flexible system (say a commission that set the percentage ethanol in fuel variably on a month ahead basis), you'd tend to worsen fuel price variability (given the extreme inelasticity of fuel demand). 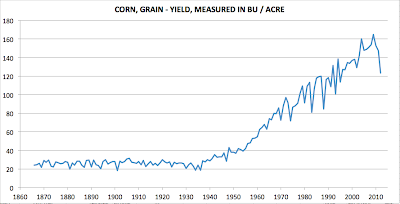 I thought that ethanol production from corn could be a "virtual granary" in a similar way to livestock, but it seems that there must be either large physical buffer stocks of grain, or large physical buffer stocks of ethanol. In Dai-world, there's no getting away from the need for multi-year buffer stocks of something. What about the other point, that increased occurrence of 'failure'* in each main growing region increases the likelihood of multiple simultaneous and/or consecutive failures more than proportionately. Do you think that will have downstream consequences? *Failure I define arbitrarily to be a yield at least 20% below that expected in an average year - enough to cause Russia, for example, to consider banning exports again.